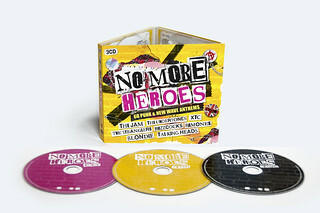 No More Heroes - CDs to be won! I have to confess that I didn’t have a particularly big record collection growing up. My parents couldn’t afford a lot of pocket money, so I didn’t have a lot of disposable income for singles – and certainly not for albums; it was easier to spare 25p or 30p for Smash Hits every fortnight than to buy records on a regular basis, which is why I have been able to spend the last six years sharing my collection on this archive. 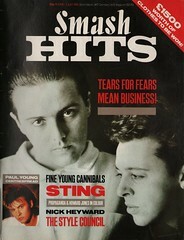 Ever since I first dived into my Smash Hits collection and began reliving those times, the question I have asked repeatedly has been: "Did we realise how lucky we were?" We were spoiled. During my formative years, the charts were bursting with great music; there was so much variety and invention in the British top 40 of the late seventies and early eighties – an explosion of talent that has never been repeated to such a degree. No More Heroes tackles the well-nigh impossible task of distilling the spirit of those heady days into three discs. Listening to its sixty tracks is a whirlwind spin through the golden age of punk, post-punk and new wave. 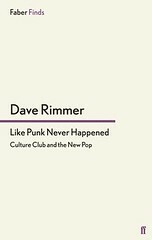 Chart-toppers from The Jam, The Specials and Ian Dury rub shoulders with classics from Madness, Buzzcocks and Adam and the Ants; American acts like the Ramones, Modern Lovers and Talking Heads pogo with Generation X, XTC and X Ray Spex. Alongside the more familiar titles are things you might have forgotten: I am particularly excited by the inclusion of Back Of My Hand by the Jags – why wasn’t that a bigger hit?!!? From calls to action by the likes of Sham 69 and Secret Affair to the endearing goofiness of the Toy Dolls and Tenpole Tudor, this is a reminder of that incredible outpouring of energy. Some of these acts cast long shadows; others crashed and burned spectacularly, but from the unmistakable opening of Teenage Kicks to Jona Lewie’s anthem for wallflowers, there’s hardly a dull moment here. No More Heroes is an ideal way to fill some of the gaps in your collection – or a great introduction to the great sounds of a great moment in musical history. 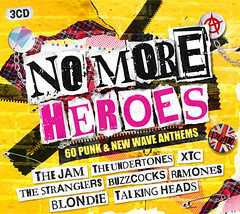 It doesn’t claim to be all-inclusive, but what it does include is good enough for me: Blondie, The Fall, Echo and the Bunnymen, Bow Wow Wow, Dr. Feelgood....Realising that some of these songs were recorded forty years ago should make me feel old, but listening to them puts a spring in my step. 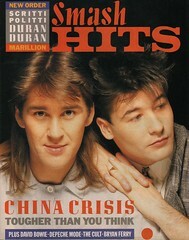 So go ahead, open up a copy of Smash Hits, crank up the stereo and enjoy! No More Heroes is available from Amazon UK and iTunes....but keep reading to find out how you could win a copy for yourself in our very first competition! The makers of No More Heroes have given us three copies of the boxset to give away to fans of this Smash Hits archive. To have a chance of winning, go to our Facebook page and leave a comment listing your three favourite tracks from the compilation and three songs which you think should have been included. 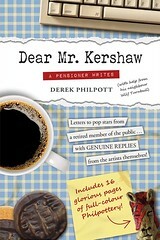 Everybody who posts a comment listing six titles will be entered into a draw - three names will be selected and those winners will get the CDs. The Return of Zitty Ben! Strange Tales From A Music Paper was the comic strip that ran in Smash Hits 1980 - 1981. The strip's creator, Mark Casto, believed that all his work was lost until he discovered this archive and was able to read his strips for the first time in thirty years. Mark's new blog collects The Adventures Of Zitty Ben in one place - and he has taken up his pens and pencils to draw the first new Zitty Ben strips since the early eighties. As if that weren't exciting enough, I am delighted to find that yours truly makes an appearance in this cartoon - as the angelic being who reawakens Zitty from his slumbers! 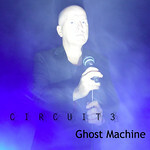 "Coronation Street"; Nile Rodgers, "B-Movie Matinee", "Let's Go Out Tonight"; Howard Jones; Men At Work, "Two Hearts", "Everything I Need", Colin Hay; "The Breakfast Club"; Morgan McVey: Cameron McVey, Jamie Morgan; Al Corley, "Dynasty", "Square Rooms"; Billy Idol, "Vital Idol"; Steve Strange; Pink Industry, Jayne Casey, Ambrose Reynolds, "New Beginnings", Morrissey, "What I Wouldn't Give"; Tears For Fears, "Head Over Heels"; The Go-Gos split; Propaganda; "Massive", Smiley Culture, Barrington Levy, Aswad; 10,000 Maniacs, "Can't Ignore The Train"; Culture Club, Marilyn, Diana Ross, Boy George; Dead Or Alive, "In Too Deep", "Youthquake"; The Sensible Jerseys, "Right And Wrong"; Millie Jackson, Elton John, "Act Of War"